NEW YORK — In the hills and dales of Pradagonia — a terrain of the mind rather than the land, an urban aspiration for an out-of-reach wilderness — the fleece reigns supreme. Fashion in recent years has been captured by a wild yearning, if not to visit the great outdoors, at least to dress for it. The chunkier the sneaker, the fatter the price tag. The tougher the puffer, the closer to God. But in at least some corners of this movement — soi-disant “Gorpcore,” as in the hiker’s snack — there is no piece like the fleece, and no fleece like Sandy Liang’s. Liang is a New York womenswear designer, city-born and -reared, the country at a comfortable remove. But a few years ago, drawing inspiration from the hand-me-downs of her youth, she tried to make her own version of a garment she had hated having foisted on her as a child: the nubby winter layer well-known to anyone who has stopped by a Patagonia shop. The fleeces were not an immediate hit. “Not too many stores ordered them,” Liang said in an interview, but those that did generally sold well. Her version, which might incorporate flashes of neon lining, or bold patches of leopard print gave a staple new life. She continued tweaking the designs and kept them in her collections, and demand only continued to rise. The response gave Liang the confidence to plunge ahead and introduce an official men’s collection, which she showed during New York Fashion Week on Sunday in her first staged show. Her fleeces had always been unisex, she said, but she recalibrated the fit to make them more friendly for everyone. When the fall collection begins arriving this summer, the fleeces will be sized XS to L, rather than the women’s 2, 4, 6, 8, 10 sizing that mystified some of her male customers. At the show, she presented a leopard version and a camouflage version, their pockets dressed up in shiny onionskin fabric, and one that was a patchwork of the two. Earlier models dotted the crowd, too, and on a poster given out at the door, her grinning grandmother is pictured in a leopard one, a celebrity in the making photographed by the designer herself. 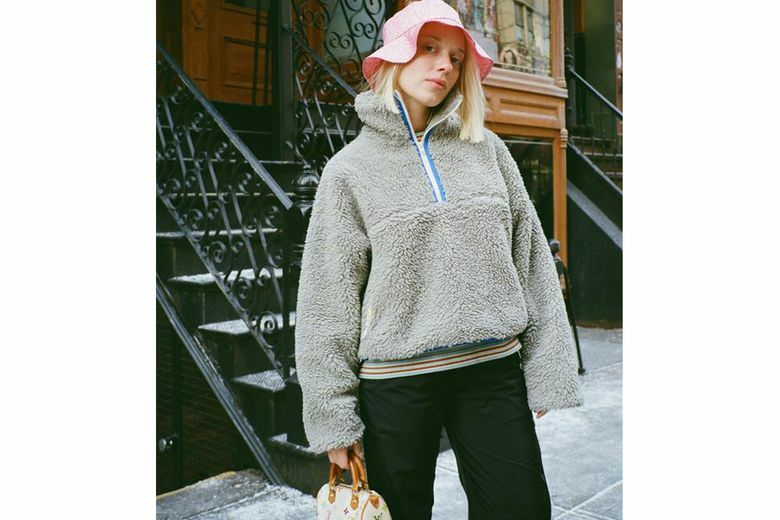 The fleeces weren’t the collection’s only strong looks (the puffer trimmed with floral embroidery was great too), but they drew the most immediate gasps and, according to the designer, aren’t going anywhere. One version will live on her website while she continues to play with new versions. In the fall collection, one had already morphed into a fleece dress.